This class contains one unit definition plus some meta information, e.g. whether the unit was provided or calculated, if it is unknown or if there is a conflict. Definition at line 99 of file CSBMLunit.h. Definition at line 103 of file CSBMLunit.h. Definition at line 182 of file CSBMLunit.cpp. Definition at line 189 of file CSBMLunit.cpp. Definition at line 196 of file CSBMLunit.cpp. Definition at line 203 of file CSBMLunit.cpp. Definition at line 210 of file CSBMLunit.cpp. References DEFAULT, DERIVED, CSBMLunit::getDisplayString(), GLOBAL, mConflict, mInfo, PROVIDED, and UNKNOWN. Referenced by CSBMLunitInterface::debugOutput(), and CSBMLunitInterface::determineUnits(). Definition at line 130 of file CSBMLunit.h. 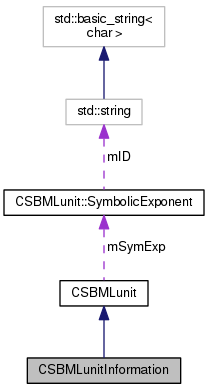 Referenced by Expression2PresentationMMLUnits::getMathML(), CSBMLunitInterface::handleOneExpression(), CSBMLunitInterface::handleTerminalNode(), CSBMLunitInterface::initializeFromSBMLModel(), CSBMLunitInterface::recursionDivide(), CSBMLunitInterface::recursionEqual(), CSBMLunitInterface::recursionPiecewise(), CSBMLunitInterface::recursionPower(), CSBMLunitInterface::recursionTimes(), and CSBMLunitInterface::writeBackToModel(). Definition at line 136 of file CSBMLunit.h. Referenced by Expression2PresentationMMLUnits::getMathML(), and CSBMLunitInterface::handleTerminalNode(). Definition at line 240 of file CSBMLunit.cpp. References CSBMLunit::isEqual(), mConflict, and mInfo. Definition at line 133 of file CSBMLunit.h. Definition at line 127 of file CSBMLunit.h. Referenced by CSBMLunitInterface::handleTerminalNode(), CSBMLunitInterface::initializeFromSBMLModel(), CSBMLunitInterface::recursion(), CSBMLunitInterface::recursionDivide(), CSBMLunitInterface::recursionPower(), and CSBMLunitInterface::recursionTimes(). Definition at line 146 of file CSBMLunit.h. Referenced by getDisplayString(), isConflict(), isEqual(), and setConflict(). Definition at line 143 of file CSBMLunit.h. Referenced by getDisplayString(), getInfo(), isEqual(), and setInfo().